White glaze inside and 3/4 outside with a bottom black glaze. Flat trimmed bottom, perfect for hot drinks. 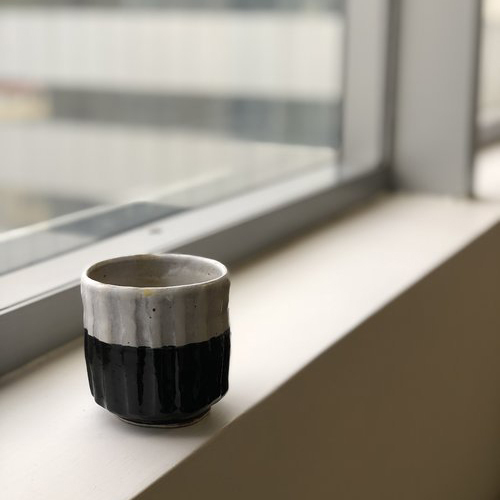 Handmade wheel throw cup. Great for a large cup of Iced tea or Americano. The outer of the cup is a fun texture to hold with. Hand made, wheel thrown coffee cup. Great for medium cup of latte. The rim at the bottom is perfect for holding. One hand held size, white and brown stripped slip. Flat trimmed bottom, perfect for hot drinks. One hand held size, white and blue stripped slip. Flat trimmed bottom, perfect for hot drinks.